I arrive at Kampala airport at 4:30 a.m. on a Monday morning, dazed from the two consecutive overnight flights I took to get here. Fortunately my driver, Happy, is here to greet me. That’s his real name. One thing I quickly learn is that Ugandans have this endearing quality of using virtues as names – Happy, Innocent, Mercy, etc. The downside, I suppose, is the risk that an individual will not live up to the name. Fortunately, Happy is just that, and he cheerfully loads me into his sturdy old Toyota van for a 90-minute ride to my destination, Uganda Christian University, home of the CCCU’s Uganda Studies Program (USP). I’m here not just as the CCCU’s vice president of academic affairs, but as a student, eager to learn about the program and get a taste of what USP students experience. Of course, that experience begins with jet lag. So I attempt a two-hour nap before grabbing a quick breakfast and heading to the Faith and Action capstone class taught by Rachel Robinson, the USP program director and leader of its General Studies Emphasis. Here I’m treated to a vigorous discussion of James K.A. 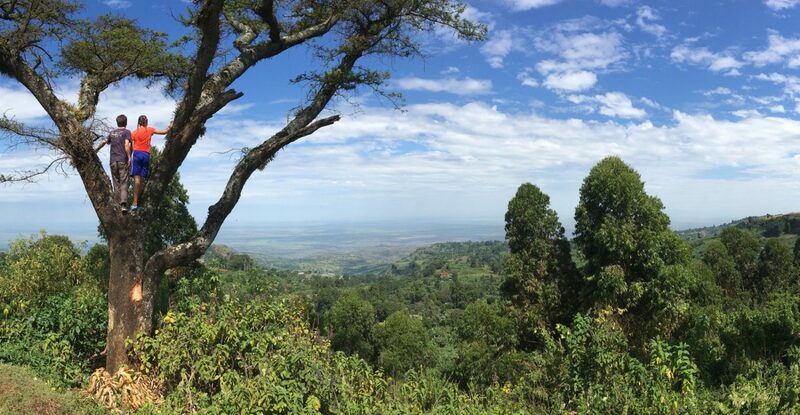 Smith’s Desiring the Kingdom as viewed from a Ugandan perspective. Later, I join a discussion followed by dinner with the USP social work students and their counterparts at Uganda Christian University. It’s one of a series of meetings between these two groups throughout the semester – the brainchild of USP social work coordinator Lisa Tokpa (who leads USP’s Social Work Emphasis) and Kasule Kibirige, head of the social work department at UCU. These meetings enable American social work students to experience firsthand the culturally embedded nature of their discipline. The conversation ranges over ethical dilemmas in Ugandan and U.S. contexts and how the social worker’s obligations differ in individual-based versus community-based societies. It’s the sort of educational experience that students can’t get by watching a film about Ugandan social work practices in a classroom in the U.S.
After a well-earned night of sleep, I set out the next morning with Micah Hughes, the coordinator of USP’s Global Health Emphasis, and two students to visit some internship sites. In 2003, Micah spent six months in northern Uganda researching the AIDS epidemic and doing community health education; he also participated in short-term community health and nutrition work from 2008-2015. Two years ago he joined USP to start this new track in partnership with Westmont College. Micah has become adept at negotiating Ugandan traffic. Traffic lights are virtually non-existent in Uganda. Taxis swerve in and out of the only paved two-lane road in the region, and 125cc motorcycles called boda-bodas dart in and out of traffic. The previous day, Micah lost the outside of his rear fender in a roundabout, which now attracts the concerned attention of other university drivers at our departure point. Ugandan vehicles endure a beating, but their owners tend to be fastidious about patching, painting, and polishing up the damage. Fortunately the Toyota SUVs are both commonplace and virtually indestructible. Our first Global Health site is “ROTOM,” an acronym for “Reach One, Touch One Ministries,” which was founded to reach a forgotten group in Uganda – the elderly. The average life span in Uganda is 62, and the nation’s census has no category beyond age 60. But because of the recent AIDS epidemic, many of the elderly care for grandchildren, so by reaching an elderly person with health care and economic assistance, this ministry has a ripple effect on several other lives as well. The USP students working at ROTOM experience what it’s like to create new health care systems and practices where none existed before. Next we visit ACHERU, a ministry to another neglected group in Uganda – disabled children. The facility provides medical treatment, physical therapy, and rudimentary education to children in the Kampala area. The ministry also has a ripple effect in society, since in Ugandan society, a child’s disability is typically blamed on the mother, who is often subsequently abandoned by her husband. This organization has special interest for me because two years ago, my daughter Anna participated in USP and was a student intern here. When Micah introduces me to staff members as the vice president of the CCCU, they nod politely. But when he mentions that I am Anna’s father, enthusiastic smiles light up their faces. Later, I have lunch with the Global Health students to talk about their experiences so far. They appreciate the fact that their internship supervisors treat them like normal students who are here to learn, not white people – “Muzungus” – with assets to dispense (all of the USP students this semester happen to be white). Nevertheless, their status as a tiny minority in this setting is something they are constantly aware of – and something that I have already noticed. After only two days here, I have grown weary of the feeling of being on public display, and I wonder if that feeling dissipates with time. The next day, Lisa picks me up first thing in the morning to take me to one of her social work internship sites. Along with two students, we visit St. Peter’s Child Development Center, a function of Compassion International. We meet with the St. Peter’s staff over a Ugandan “tea” consisting of tea, coffee, greens, potatoes, plantains, and liver (fortunately, I love liver). We talk about how an internship in Uganda helps students experience just how important cultural context is to social work practices. For example, in America, we have a formal child welfare system made up of foster homes that can be utilized in cases of abuse. But in a society in which a formal network of resources is scarce, our students’ supervisors caution the students to consider, “Where are you removing the child to?” The new placement might be worse than the situation they are already in, and so the Ugandan social worker’s best alternative might be to begin by warning – and reforming – the caregiver rather than immediately removing the child. Over lunch, I talk with Lydia and Innocent, two Uganda Christian University staff members who assist with USP. As I eat my fish stew (with the fish tail sticking out the side of the bowl), they tell me what they enjoy so much about the American students – their curiosity, their adventurous spirit, and their willingness to jump into any new situation. Of the nine BestSemester programs, Uganda Studies offers one of the most extreme opportunities for cross-cultural immersion. It’s difficult to imagine many places that could be more different from a North American middle-class suburb as this bustling East African town. Later that evening, I have dinner with the Tokpa and Hughes families in Rachel’s home, where I learn something of both the satisfaction and the challenges of leading a semester abroad program. Lisa and Eddie have been in the process of adopting a Ugandan baby boy since last fall, and since his adoption and visa arrangements are not completed, that has meant over a year of separation from Lisa’s family back home. Micah and Avrey had a baby girl when living near Micah’s parents in Colorado a couple of years ago, then promptly packed up the family and moved to Uganda. The next morning, Rachel and I meet with John Senyonyi, vice chancellor (the equivalent of president) of Uganda Christian University. John is a frequent visitor to CCCU presidents’ conferences in the U.S. and has worked hard to connect UCU with stateside CCCU institutions. He has also led UCU to resist the emphasis on specialization that characterizes African education and instead incorporate some of the Christian liberal arts emphasis of CCCU schools in the U.S. Much of the success of the Uganda Studies Program, now in its 14th year of operation, can be attributed to the gracious hospitality provided by its host institution in Mukono. Later I attend the UCU chapel service, which features a somewhat more energetic worship style than one experiences at most U.S. Christian colleges. After a time of worship and announcements, students are treated to a lively sermon about the importance of leaders having the humility to eventually step aside and let others take their place as leaders. It’s an interesting sermon topic in a country that has been governed by a single ruler for over 30 years, and its timing comes one week after the overthrow of Robert Mugabi in neighboring Zimbabwe. After lunch and many farewells, I set off with Happy back to Entebbe Airport. In late afternoon, the narrow streets of Kampala are choked with traffic, and what was a 90-minute drive three days earlier turns into a four-hour return trip. That affords me the opportunity to learn more about Happy, who, like many Ugandans, is a refugee from elsewhere. His parents fled to Kampala from Rwanda, and like many East Africans, Happy speaks four languages, which is 2½ more than I speak. I do my best to explain to Happy what it’s like to have eight hours of daylight for part of the year and 16 hours in other parts of the year. Here on the equator, the sun rises and sets like clockwork at 12-hour intervals the entire year. I also do my best to explain ice-fishing and snow-plows. Eventually I arrive at the airport and set off on your basic Kampala-Kigali-Brussels-Chicago-Grand Rapids series of plane rides, providing ample opportunity to reflect on the CCCU’s commitment to operating semester abroad programs, which it has done since its inception 42 years ago. If Christian higher education is truly about forming the entire person as a follower of Christ, not just providing career skills, then that an extended, intentionally designed cross-cultural experience such as USP is at the heart of what we do. Jamie Smith’s Desiring the Kingdom is a book that is widely discussed not only in Rachel Robinson’s “Faith and Action” class but throughout the CCCU, and for good reason. Smith’s basic point is that true Christian formation happens not by pouring information into the brain but through habits and liturgies that are practiced consistently and communally over an extended period of time. Lived experience is formative intellectually and spiritually, but the transformation takes time, like sirloin tips in a crockpot, not leftover pasta in a microwave oven. This is why well-constructed, Christian-based, semester-long programs such as USP are so valuable. Students placed in a new environment through USP are engaging their whole being almost constantly by questioning inherited assumptions, developing new practices, encountering new perspectives, and being forced to rely on God in ways they never have before. Actually, my daughter Anna summed up the impact of USP quite well at the end of her semester there, and her words have stuck with me: “Ultimately, what I have gained from my semester in Uganda is faith in a God who is good, hope that all will be made new, and love for the world in all of its beauty and brokenness.” I can’t imagine a better outcome. Rick Ostrander is the vice president for academic affairs and professional programs at the CCCU. The Global Health Emphasis (GHE) allows students from biology, nursing, pre-health professions, and public health disciplines to complete undergraduate degree-specific coursework at Uganda Christian University while participating in global health internships. GHE students complete experiential learning with faculty guided oversight to ensure an appropriate scope of learning that includes internship opportunities with the Ugandan Ministry of Health, pediatrics clinics, herbal medicine, labor and delivery wards, and public health organizations. As students engage in four months of experiential learning, with mentorship from Ugandan and American faculty, they gain valuable insights into the expanding field of global health and gain competencies for future work with diverse populations. GHE students have the choice to live with local host families or international roommates on campus. In the past two years students have transferred credit to CCCU institutions in epidemiology, microbiology, nutrition, infectious diseases, immunology, and advanced nutrition. GHE courses and internships allow students to cultivate applied knowledge, develop international relationships with local clinicians, and engage broader issues of aid, development, medical missions, and cross-cultural healthcare. The Social Work Emphasis offers exciting international field education for Bachelor of Social Work students through a framework of cultural humility, CSWE competencies, and experiential learning. Social work students have the opportunity to conduct junior- and senior-level field placements within partner organizations that serve orphans and vulnerable children, people with disabilities, the elderly, young mothers, refugees, and others. Unique to this program, field placements are supervised by both a Ugandan and American (MSW) field instructor, helping students to see first-hand how context shapes practice. The social work field experience and accompanying seminar discussions shed light on the rewarding and challenging nature of cross-cultural social work, while simultaneously helping students to translate and apply their professional growth to a Western context. While the field placement is the focus of social work students’ semester, further cross-cultural engagement takes place within a partnership with Uganda Christian University’s (UCU) social work department, where USP students learn from their Ugandan peers and UCU faculty about the universalities of social work while gaining a deeper understanding of the critical role diversity plays in the profession.